An adjective describes or modifies noun/s and pronoun/s in a sentence. It normally indicates quality, size, shape, duration, feelings, contents, and more about a noun or pronoun. Adjectives usually provide relevant information about the nouns/pronouns they modify/describe by answering the questions: What kind? How many? Which one? How much? Adjectives enrich your writing by adding precision and originality to it. However, there are also many adjectives which do not fit into these questions. Adjectives are the most used parts of speech in sentences. There are several types of adjectives according to their uses. A descriptive adjective is a word which describes nouns and pronouns. Most of the adjectives belong in this type. These adjectives provide information and attribute to the nouns/pronouns they modify or describe. Descriptive adjectives are also called qualitative adjectives. Participles are also included in this type of adjective when they modify a noun. The hungry cats are crying. A quantitative adjective provides information about the quantity of the nouns/pronouns. This type belongs to the question category of ‘how much’ and ‘how many’. A proper adjective allows us to summarize a concept in just one word. Instead of writing/saying ‘a food cooked in Chinese recipe’ you can write/say ‘Chinese food’. Proper adjectives are usually capitalized as proper nouns are. American cars are very strong. Chinese people are hard workers. A demonstrative adjective directly refers to something or someone. Demonstrative adjectives include the words: this, that, these, those. A demonstrative pronoun works alone and does not precede a noun, but a demonstrative adjective always comes before the word it modifies. A possessive adjective indicates possession or ownership. It suggests the belongingness of something to someone/something. Some of the most used possessive adjectives are my, his, her, our, their, your. All these adjectives always come before a noun. Unlike possessive pronouns, these words demand a noun after them. His cat is very cute. An interrogative adjective asks a question. An interrogative adjective must be followed by a noun or a pronoun. The interrogative adjectives are: which, what, whose. These words will not be considered as adjectives if a noun does not follow right after them. ‘Whose’ also belongs to the possessive adjective type. 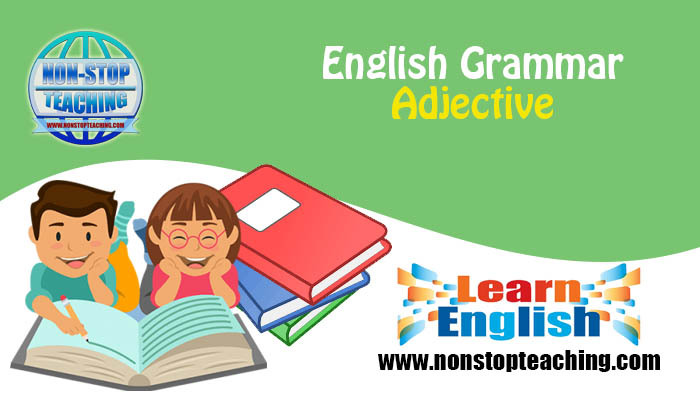 An indefinite adjective describes or modifies a noun unspecifically. They provide indefinite/unspecific information about the noun. The common indefinite adjectives are few, many, much, most, all, any, each, every, either, nobody, several, some, etc. I gave some candy to her. I want a few moments alone. Several writers wrote about the recent incidents. Each student will have to submit homework tomorrow. Articles also modify the nouns. So, articles are also adjectives. Articles determine the specification of nouns. ‘A’ and ‘an’ are used to refer to an unspecific noun, and ‘the’ is used to refer to a specific noun. An electronic product should always be handled with care. When compound nouns/combined words modify other nouns, they become a compound adjective. This type of adjective usually combines more than one word into a single lexical unit and modifies a noun. They are often separated by a hyphen or joined together by a quotation mark. There are three degrees of adjectives: Positive, comparative, superlative. These degrees are applicable only for the descriptive adjectives. Positive degree: He is a good boy. Comparative degree: He is better than any other boy. Superlative: He is the best boy. An adjective describes or modifies noun/s and pronoun/s in a sentence. It normally indicates quality, size, shape, duration, feelings, contents, and more about a noun or pronoun. Adjectives usually provide relevant information about the nouns/pronouns they modify/describe by answering the questions: What kind? How many? Which one? How much? Adjectives enrich your writing by adding precision and originality to it.